Press Pass Q: When did you launch your publication, and what inspired you to do it? Publisher Tom Dyer: The first issue came out on August 31, 1994. Orlando had a growing LGBT community with few ways to communicate with each other or to share things of importance. I felt like the lack of a newspaper was holding us back. But what really inspired me was a trip to Atlanta. I was eating lunch in a restaurant in Virginia-Highlands and saw a half-dozen people reading their just-delivered Southern Voice. It was something I wanted for Orlando. Watermark expanded to cover Tampa Bay in 1995. Dyer: Other than our longevity, I’d say we’re distinguished by a crisp, eye-catching design that is a true hybrid of newspaper and magazine. The competition for advertising dollars mostly comes from local alternative weeklies that now have substantial coverage of the LGBT community. There’s no other LGBT newspaper in the area. There are two or three statewide bar/nightlife magazines. Dyer: We were undercapitalized, so things were very tight for the first two to three years. I worked long hours and took no salary while trying to stay on top of a law practice. PPQ: Is it successful now, and how do you gauge that? Dyer: I’d call it a success. 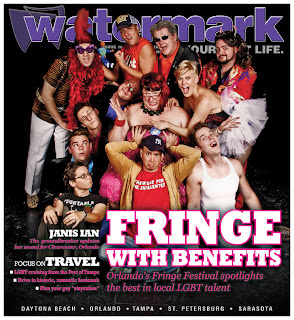 Watermark is going into its 19th year. 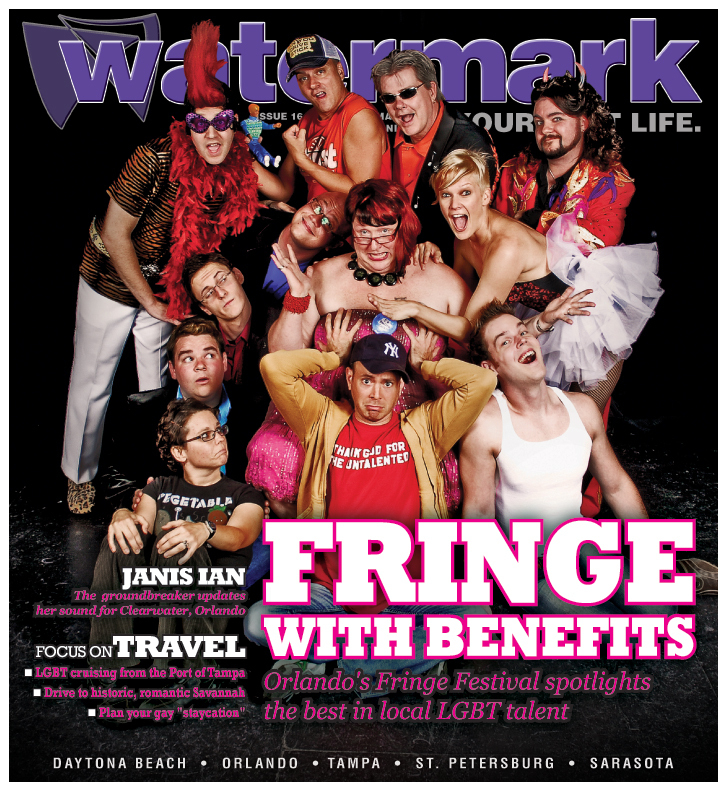 We’re the newspaper of record for the very active and thriving LGBT communities in Tampa Bay and Orlando. Our web site is updated daily and gets lots of traffic. We own an office complex in a great neighborhood in downtown Orlando. We pay competitive salaries with full benefits to a dozen people. We have a respected and experienced staff. I’m happy and proud. Dyer: From 2002-2007, almost 30 percent of our advertising was related to the booming real estate market. By 2008, that had completely evaporated, and our page count went down. But we’ve adapted, and real estate advertising is coming back. Dyer: The biggest challenge is managing this interesting, exciting, confusing time when we still have tens of thousands of print readers, but our biggest growth is in online readership. If there’s a local LGBT publication that’s successfully monetized their web site, I’d love to hear from them. Dyer: When Watermark first came out back in 1994, it was a real coup to get interviews with celebrities like Lily Tomlin, Billie Jean King and Gloria Steinem. Those interviews were often the centerpiece of the publication. Now that LGBT culture has mainstreamed, our biggest focus is on local news, where a lot of exciting things are happening. Orlando just elected on out state legislator – a first for Florida. Orlando, Tampa, St. Petersburg, Clearwater and Sarasota all passed domestic partner registries in the last 18 months. Dyer: I continue to be surprised by filters based on perception. People from Tampa Bay think we focus on Orlando news; in Orlando, some think the whole paper is about Tampa Bay. The same goes for men and women, coverage of the transgender community, etc. My hope is that people will find all of the content – and all aspects of our diverse culture – interesting. Dyer: I’m 57 and resist change. I just started reading the New York Times on my iPad, so I now have at least some comprehension of the future. So I’d say try and stay ahead of – or at least not too far behind – the new media curve. It’s exciting, and there’s lots of opportunity. Of course, the advice you give is usually the advice you need. It’s a challenge for any community newspaper these days — how to continue reaching loyal readers at a time when the dynamics of how publications raise revenue are changing. In that light, Boston-based Bay Windows is trying a new strategy — a direct appeal to readers for financial contributions. For a month now, O’Connell and co-publisher Jeff Coakley have been making their case in the weekly print issue, on the publication’s website, and through social media. In reaching out to readers for support, Bay Windows is not using the public broadcasting model with a specific dollar amount goal to be reached by a certain date, O’Connell explained. Rather, the co-publishers plan to push the appeal four times a year. “But every day and every week we will have ads in the paper and on the web,” said O’Connell. O’Connell said that she and Coakley have been thinking about a direct appeal to readers for several years. “We have been trying to figure out what are the best ways to add revenue streams to the paper,” she said. Reader reaction to the appeal so far has been favorable. “We’ve only heard overwhelming support not only from our supporters and friends in the community, but also from readers we never had any contact with before,” said O’Connell. “The general audience is better educated about the challenges that print publications have and what the value of print publications is,” she said. O’Connell was referring to the recent demise of the Boston Phoenix, a longtime alternative weekly. How then does a weekly newspaper like Bay Windows make it in a changing market? “There’s only one challenge,” said O’Connell. “I don’t mean to be simple about it. Readership is still there. The need is still there. I firmly believe that we could print more copies and they would get picked up. We print as many as we can afford to print, not as many as needed. Robert Moore, publisher and co-founder of the Dallas Voice, has stepped down after nearly 30 years. Moore has sold the publication’s parent company, Voice Publishing Company, Inc., which also produces Dallas Voice Yellow Pages and online product developer Digital Seltzer. The buyers are Leo Cusimano and Terry Thompson, who currently serve as advertising director and promotions manager, respectively. Cusimano took over as publisher on April 1, with Thompson assuming the role of president. Moore, 57, said he plans to remain involved with Voice Publishing as a consultant. Reactions to the news of his retirement prompted praise for Moore’s contributions to LGBT media and the larger Dallas gay community. "Robert has always been a focused, professional voice of reason in the landscape of gay media,” said Tracy Baim, publisher and executive editor of Chicago’s Windy City Times. “Those involved in this niche have tended to be large personalities that often clashed with one another. But Robert always seems to be the calm in the middle of the storm. His voice will be missed in our gay media gatherings,"
Moore launched Dallas Voice in 1984, along with business partners Don Ritz and William Marberry. From the very beginning, the three men had definite views on what the publication would be. They wanted the publication to be a successful business, too, said Moore. In the book, the retiring publisher also discussed his philosophy of management. Moore voiced confidence in both Cusimano and Thompson and the future of Voice Publishing. Cusimano, who has worked at Voice Publishing for more than 20 years, also said that Chad Mantooth, currently advertising account manager, will become associate advertising director. Fab magazine, Toronto's biweekly gay lifestyle and nightlife magazine, is ending its publication after nearly 20 years. Fab publisher Pink Triangle Press (PTP) made the announcement on March 12. Publisher Brandon Matheson explained the difficult decision was purely financial and is part of a larger restructuring plan for PTP. The company will continue to publish Xtra, the company’s tabloid LGBT weekly. Ten staffers will lose their job as a result of the closure. Sixty-four full-time staff will remain at PTP. The company also announced the pending sale of HARDtv and recently sold its shares in OUTtv, two national gay cable TV outlets. Since Villeneuve took over as editor in 2012, “the glossy magazine has undergone a dramatic redesign and has grown to better reflect the playful and cheeky side of Toronto’s gay scene,” wrote Andrea Houston in Xtra. Words of condolence came from readers on social media following the announcement. Fab was first launched in 1994 to compete with Xtra, according to PTP executive director Ken Popert. PTP purchased it in 2008. PTP is certainly not alone. Toronto dailies have recently enforced pay walls while announcing sweeping layoffs and plans to outsource key editorial departments. “There are an awful lot of forces conspiring against print right now,” Popert said. On a more encouraging note, Matheson points out that Xtra and Fab are no longer the only Toronto publications where readers will see advertisements featuring gay and lesbian couples. Despite an ambitious relaunch in early 2012, Just Out Portland’s publishers announced the paper’s second demise through the publication’s Facebook page in late February. Jonathan Kipp and Eddie Glenn posted the statement on February 26, thanking their contributors, readers and advertisers who had supported the project during its brief nine-month run. Kipp did not return requests for comment from Press Pass Q. Editors of other Northwest LGBT publications also gave no comment. In October, Press Pass Q reported the return of Just Out Portland along with an interview with Kipp — who had previously written for Just Out Portland in the 1990s — where he expressed excitement at the possibilities ahead for the paper (“Oregon’s Just Out Portland returns under ownership of former reporter,” http://www.presspassq.com/detail.cfm?id=131#news). Kipp said he and a staff of five including Glenn, editor in chief Alley Hector, art director Horace Long, and sales manager Roy Melani worked full-time day jobs outside of their work with Just Out, and believed the team treated the resurrection as a labor of love. Kipp and Glenn had hoped to save the storied publication when long-time publisher Marty Davis announced in late 2011 that she was no longer able to keep the doors open. By June, Kipp and Glenn had formed their core team and reimagined the longtime tabloid newsprint publication as a monthly color glossy magazine that put a greater focus on “individuals,” according to Kipp. Following the December 2011 announcement of the demise of Just Out, however, another Portland area publisher, Melanie Davis, publisher of El Hispanic News, jumped into the Portland LGBT print arena. In February of 2012, she and editor in chief Julie Cortez launched PQ Monthly, which maintained a newsprint publication style (see story below). As of publication, the Just Out website continued to be live, but has not been updated since early February. The Valentine’s Day issue was the magazine’s final print edition. The end of publication of Just Out comes in the year that the title would have celebrated its 30th anniversary. When Portland's Just Out ceased publication in December 2011, out lesbian publisher and owner of El Hispanic News, Melanie Davis, said that business leaders and community members approached her about using her resources to keep an LGBT publication alive in diverse Portland. The result was a brand new monthly newspaper for the local LGBT community called PQ Monthly, which celebrated one year in print on February 21. "It was a very quick and sudden thing. I think she pitched the idea in mid-December, and we had our first issue out by February," Julie Cortez, editor in chief of PQ Monthly and El Hispanic News, told Press Pass Q. The 32-year-strong local El Hispanic News moved to a monthly publication cycle in 2009 and became involved in LGBT publishing soon after when the paper partnered with Pride Northwest in 2010 to produce the annual Pride Guide. Beyond the guide, however, Davis and her team added an insert component for other local multicultural media outlets as a communications piece, "to better understand the LGBTQ community," according to Davis. "For two years we had that contract, and it went extremely well," Davis said. "It was well received not only by the LGBTQ community, but the diverse publications as well, and their leaders." The Pride Guide won major awards two years in a row from the National Association of Hispanic Publications, and Davis knew she was on to something. When the community asked, Davis stepped up with a publication unlike any other in a city that embraces the different and unique. "Our mission is to ensure that every letter and every color is represented," Davis said, noting the publication takes pains not to "tokenize" or "ghettoize" any component of the community, ensuring a diversity in representation at all times, and even assuring that diversity is reflected in her staff. "We share the stories of our everyday people who are creating the ripple effect of change, from local DJs who are trans identified to those living in our mainstream black community who are queer identified." For Cortez, the "every color" portion of the mission statement not only refers to the LGBT community's flag, but different cultural groups that intersect with the queer community. "There isn't one monolithic identity that represents the LGBT community, or one perspective," Cortez says. "Trying to represent the beauty and complexity and growth and change that's been happening in the LGBT community, especially now, as ideas are expanding … about gender, about sexuality, about identity. We've challenged our readers to think beyond what's been considered the norm," Davis said, which she believes fits well in Portland's culture, where many social movements coalesce and learn from one another. "It's a comfortable place to live," Cortez said about Portland, where she originally moved for college in 1997. "It’s not to formal or too uptight. It’s not too big, but it’s not too small." People — especially LGBT people — are drawn to Portland, not just for its rivers and mountains, but for its mix of high and hip culture, outstanding arts scene, and the presence of strong social movements. Because Davis and Cortez — and much of the staff — are balancing two monthly publications, the print dates are staggered, with El Hispanic News going to press on the first Thursday of each month, and PQ Monthly the third. Both publications also deliver new content online, daily. "It’s a challenge, but its a good mind-bending, mind-expanding challenge," said Cortez about creating both publications every month. "Each month we pick a loose theme for the publication — for example [January] was 'turn the page' — and we try to examine it." PQ Monthly hosts a press party every month to mark the publication hitting newsstands, where locals are invited to gather, meet, mingle and pick up a copy of the latest issue, and to celebrate one year, February's was expanded and moved to City Hall with an after-party at a local dance club. The Other Paper ceased publication on January 31 after 23 years. The paper was owned by the Dispatch Printing company. The acquisition also included Columbus Monthly and Columbus CEO magazines and several specialty publications that continue to operate. Vitale said it was the circumstances of The Other Paper's demise which motivated him to praise the publication. A select group of LGBT media professionals gathered recently for a weekend symposium concerning a range of social justice issues of importance to the LGBT community. Sponsored by the National Lesbian and Gay Journalists Association (NLGJA) and funded by the Evelyn and Walter Haas, Jr. Fund, the 4th annual LGBT Media Journalists Convening was held the weekend of Feb. 22-24 at the Loews Philadelphia Hotel. NLGJA board member Bil Browning, founder and editor in chief of the Bilerico Project blog who organized the meeting, served as host. In all, the 2013 gathering brought together, by invitation only, 70 journalists and bloggers from various LGBT newspapers and websites nationwide. How is the convening important to gay media and LGBT editors, reporters and citizen journalists? "LGBT newspapers and blogs are not only critical sources of information for our community, they also drive public opinion and action," said Matt Foreman, program director for the Haas Fund, quoted in San Francisco-based Bay Area Reporter. "The annual convening for LGBT editors and bloggers gives these thought leaders the chance to get in-depth information about leading issues of the day, such as immigration reform, and to get to know one another,” added Foreman, a former executive director of the National Gay and Lesbian Task Force. A private family foundation based in San Francisco, Haas “promotes equal rights and opportunities with an emphasis on immigrants and gays and lesbians,” according to its mission statement. The focus of this year’s convening was coalition building. In addition to LGBT issues in immigration reform, the weekend agenda included four other 70-minute sessions, which covered the topics of LGBT workers and the labor movement, LGBT seniors and aging, international issues in global equality, and transgender issues. Philadelphia Mayor Michael A. Nutter spoke to attendees during lunch on Saturday. Longtime gay-rights activists Cleve Jones and David Mixner held a question-and-answer session during Friday night’s opening reception and dinner, hosted by Comcast atop its headquarters’ tower in downtown Philadelphia. The Greater Philadelphia Tourism Marketing Campaign sponsored a Saturday night meet-up for attendees and hosted a Sunday morning free sightseeing tour of historic Philadelphia, followed by a brunch. Non-participants were able to follow the proceedings through social media with the hashtag #LGBTmedia13. Attendees tweeted and posted as online followers commented and asked questions. In fact, “the social media aspect has grown so large that we were the top trending hashtag that day on Twitter,” said Browning. Perhaps the most detailed first-hand account of the weekend is African-American transgender activist and blogger Monica Robert’s Feb. 26 post on TransGriot (http://transgriot.blogspot.com). The social justice and coalition building focuses appealed to many attendees. “The event reinforced the need to make sure our coverage includes multiple perspectives from within the LGBT community, as well as the need to show how our work relates to issues that impact other communities as well,” said Dana Rudolph, who publishes Mombian, a lifestyle blog for lesbian mothers and other LGBT parents. “I think the event gave us the opportunity to step back from our usual areas of coverage and remember the broader landscape of which we are part,” she said. Bajko relied on comments from the Q-and-A with Jones and Mixner for one of his “Political Notes” columns. The absence of HIV/AIDS was not lost on another attendee, Mark S. King, an award-winning columnist, author, video blogger and AIDS advocate. Lavers reported on Mayor Nutter’s lunchtime remarks, in which Nutter affirmed his support for marriage equality. Highlighting his work on an LGBT senior housing project, Segal penned his weekly column as a preview of the convening. What did other participants have to say? Veteran journalist Rex Wockner offered an assessment. "The people who shape America's LGBT news come together in one place and connect, reconnect, network, hang out, drink, stay up too late and listen to presentations on topics that will be more prominent in LGBT news in coming months and years. ... [The convening] unquestionably helps the nation's LGBT journalists and bloggers get more things more right more often."